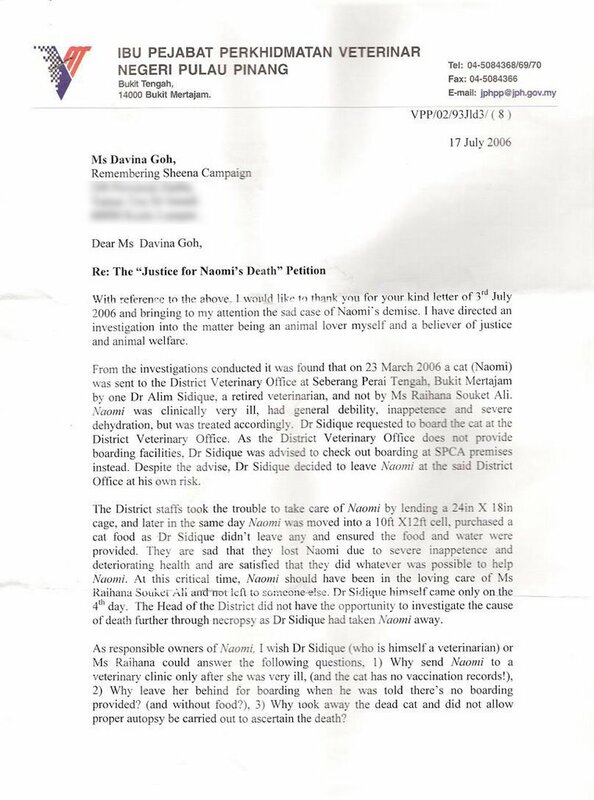 Over the weekend, I recieved a letter from the Dr. Mohd Zairi Serlan, Director of Department of Veterinary Services, Penang, in response to the Justice for Naomi Petition I personally mailed to him. It seems like he has a completely different story from what has been originally narrated to us by Raihana, Naomi's owner, although it should be taken into consideration that her story has also come second-hand from what been told to her by her family. Raihana's folks were the ones who took Naomi to the clinic, but Raihana didn't know about anything that had happened until after Naomi died. I'll be posting a reply back to Dr. Serlan to thank him for his efforts, and as well as forwarding the letter to the newspapers who have expressed interest in the case. If you have been personally spreading the word about the petition, I would greatly appreciate it if you could help send this out to those who expressed concern too. 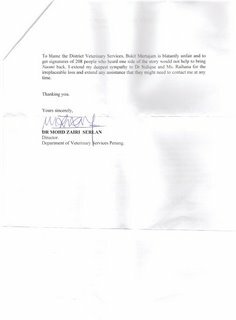 You may take a look at the letter below, as well as Raihana's response to it. I shall leave the rest to your judgement. Let's keep our voices loud and strong, and make it matter. I wish to thank every one for your support. Without you all, I would have never been able to highlight this case. In any case its only fair that we listen to both sides of the story. And now we have the clinic version. Before I go any further I just want you alll kind souls to remember that I am not doing this for financial resons, all I wanted was reasons for the cruel death of a life. Now regarding Dr Serlan's letter. 1. Why send Naomi only after she was critically ill? I didnt know she was. And is that an excuse for her death? Last time I saw her, she was not critically ill and I have vaccination records from one of the most expensive private clinics in penang island, more than 30KM away from my house in the mainland (i never had the heart to throw away anything related to my cat). The most recent vaccine was a booster I gave in January. She was hail and healthy then. 2. Why leave her behind?. 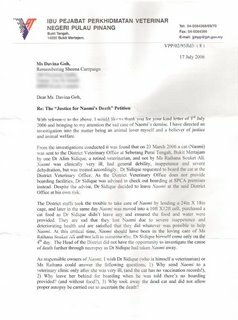 Although I personally did not leave Naomi there (I would have never done that),she was left there by my uncle Dr Siddique even though there were no boarding facilities because they promised to look after her. Being a retired vertrinarian himself, based on their promises at the clinic she was left at the care of the staff in the clinic. There was no food provided because there was no mention of it. I have left animals for boarding in clinics numerous times (and they were stray cats too) before I rehoused them. And in all those times, the clinic provided food. If the clinic were not able to feed her, why didnt they let my uncle know? 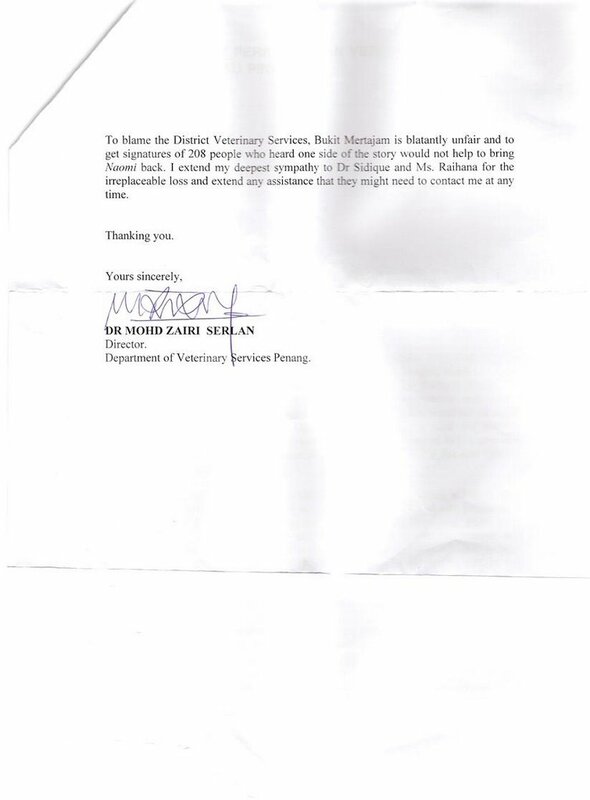 My brother was involved in this too and he has confirmed that there were promises to look after her by the staff. If the clinic did not provide such services why take her in? If they didnt atleast then they would have gone to a private clinic. My uncle was attached to the Government clinic and based on this relationship with the workers he left Naomi there. 3. They took the dead cat away because there were no mention of autopsy. If they had wanted to do an autopsy they would have to know the cat was dead. But they didnt even know it. My cousin on going to pick it up found it dead. By the way there is no vetrinarian in that clinic. It is run by a bunch of assistants with no proper qualifications. How could they diagnose the cat so accurately with no vet in there? Also the day I found out about her death I got a call from Mr Ramu who was in this from the beginning (he was one of the staff who had said he will care for naomi) When I threatened to make a case of it he apologised and said that it was the fault of one mr Raju (name not sure). Even last week Mr Ramu had gone to penang to meet my mother and before that my uncle to apologize. Why would they go to such lengths if they were in the clear. I sadly have nothing in black and white and cannot prove my case against such a big entity. But for him to shift the blame on me hurts very badly. But when has the guilty ever taken blame? Especially when it is the government? I just hope other ordinary folks do not make the mistake I made. Sadly for me there was only one Naomi. 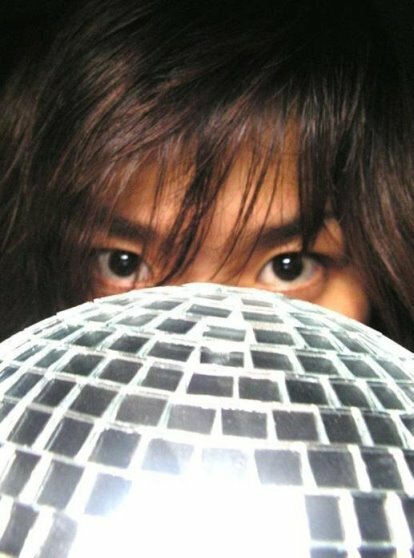 I loved her very very dearly and to think that she died in a painful way is hurtful. Yes more than anyone else I blame myself, I was not a good master in the end. And I keep thinking how much she would have wanted me there when she had no water or food. I neglected her and for that I have a lifetime to regret. As for the clinic- No they did not do whatever possible to help Naomi, they just killed her in a very agonizing way. I rather wish they just put her to sleep. Another case of shifting the blame by looking at the doc's letter. Typical of Bolehland, when it comes to shouldering responsibility and just feeling 'malu'. I betcha the doc has some political ambition rather than being taint by this 'little' incident. Poor excuse of being a vet if all he does is protecting his own hide! Hm, I would love to hear Dr Siddique's first hand explanation of what happened. Notably, if Naomi was really ill, wouldn't a retired venitarian be able to tell? i'm not too sure how much 'political ambition' is affecting what the doc has said, with both sides being defensive it's hard to tell. but thank you for your logical opinion. That's what I'd like to know too, although asking Dr. Siddique about his take on the case will only add yet another layer of complication to the story... thanks for your thoughts.